I read this article and found it very interesting, thought it might be something for you. The article is called That Dreaded (& Deteriorating) Fiscal Deficit Figure and is located at https://archive.indiaspend.com/sectors/that-dreaded-deteriorating-fiscal-deficit-figure. Can India afford to maintain a high level of fiscal deficit without affecting growth and employment? The answer is a resounding no, according to the recently released Kelkar Committee report on the roadmap for fiscal consolidation. IndiaSpend’s Dhritiman Gupta studies fiscal deficit data going back 10 years as well as the Kelkar Report. The conclusion: straight forward as it may sound, remedial measures such as reduction of subsidies and boosting tax revenue are imperative. The long and short of it is that sustained high fiscal deficit with lower growth can lead to unsustainable debt levels in the long run. And India could end up suffering the fate of countries like Greece, Portugal and Ireland. So, higher fiscal deficit can also dampen investor confidence and crowd out private investment thereby lowering growth. Let us now look at the movement of the fiscal deficit of India over the last 10 years. 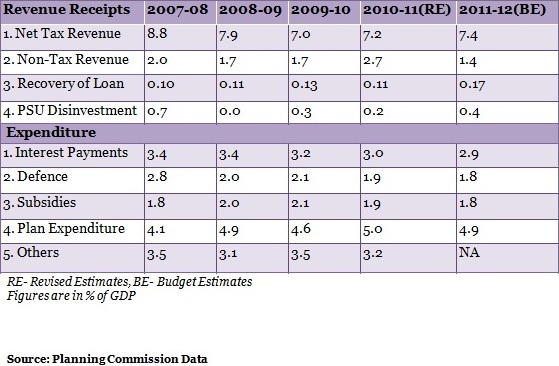 Table 1 shows the fiscal deficit and its various components over the last decade. As can be seen from (Table 1), at the start of the decade in 2001-02, the fiscal deficit of India was quite high at 6.2%. Since then, things had taken a turn for the better. The deficit was controlled through increased revenue receipts as well as curtailed expenditure. Receipts rose due to higher collection on account of higher growth rates while expenditure was managed as subsidies could be controlled. And fiscal deficit reached an impressive low of 2.5% in 2007-08. Since 2008-09, things have just turned for the worse. In 2008-09, revenue receipts-to-GDP ratio fell below the 10% mark for the first time in 2 years while expenditure-to-GDP ratio rose to almost 16% from 14.3% in 2007-08. This was on account of the fiscal stimulus packages provided by the government to counter the effects of the global recession. The fiscal deficit soared to 6% that year – an increase of 3.5% over 2007-08. Since then, the government has failed to bring down fiscal deficit below 5%. Even though budgeted to be 4.6% in 2011-12, the actual fiscal deficit in that year turned out to be 5.9%. The fiscal deficit is budgeted to be 5.1% in 2012-13. However, taking into account the trends in the first quarter of 2012-13, the Kelkar Committee report has suggested that the deficit would increase to 6.1% if various reforms are not implemented by the government. 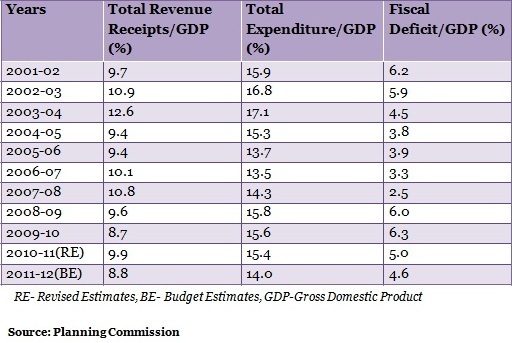 Before going into the reforms suggested by the committee, let us take a look at the components of the revenue receipts and expenditure to understand what the reforms could be and how it can help reduce the fiscal deficit by controlling the various components. As can be seen from (Table 2), since 2008-09, the net tax revenue collection as a percentage of GDP has declined. Non-tax revenue has also dropped, and was budgeted to reach a low of 1.4% in 2011-12. As far as expenditure is concerned, subsidies as a percentage of GDP picked up slightly after 2007-08. Even though it was budgeted to be 1.8% of GDP in 2011-12, it ended up being considerably higher at 2.4% of GDP, mostly on account of enhanced petroleum subsidies. As mentioned before, controlling the fiscal deficit would require measures to control the components mentioned in (Table 2). So, let us now look at some of the measures suggested by the Kelkar Committee report with regard to various components. as it will result in continuous revenue losses which the government can ill-afford at this point. This is because the Bill is expected to reduce the tax impact on individuals and businesses. On the expenditure front, the report has stressed on reduction of subsidies. The report recommends elimination of half of the diesel subsidy during this year itself by March 31, 2013, and the remaining half over the next financial year. Similarly, it has also recommended elimination of LPG (cooking gas) subsidy by 2014-15 by reducing it by 25% this year with the remaining 75% reduction over the next 2 years. 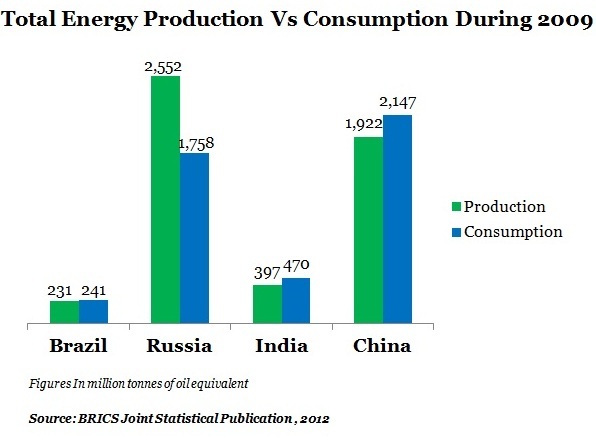 For kerosene, the objective should be to reduce the subsidy by one-third by 2014-15. With regard to immediate action, the report recommends increasing the price of diesel by Rs 4 per litre, kerosene by Rs 2 per litre and LPG by Rs 50 per cylinder. When it comes to fertiliser subsidies, the report has recommended a sustained increase in the price of urea. This, as the report points out, would not only reduce the fertiliser subsidy bill but would also help restore balance in the ratio of usage of different fertilisers, thereby helping conserve soil in the long run. 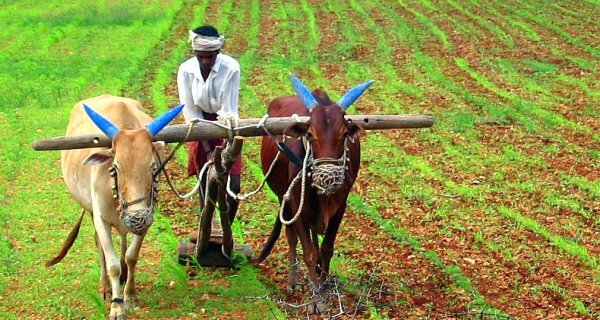 On the food subsidy front, the report suggests hiking the central issue price (CIP), the price at which the centre issues ration to the needy; in proportion to the minimum support price (MSP) at which the government buys produce from the farmers. The report also stresses on the need for proper targeting of food subsidies to the needy, thereby supporting the policy of direct transfer of cash subsidies instead of the proposed coupon-based system where identification could become a problem. The committee feels that with the implementation of the reforms, the fiscal deficit could be controlled at 5.1% in 2012-13. Without them, the deficit is expected to zoom to 6.1%. One could agree or disagree with the policies suggested in the report but what cannot be ignored is the fact that fiscal deficit has to be reined in. Otherwise, in all probability, India will be stuck with lower growth, high unemployment and rising inflation!